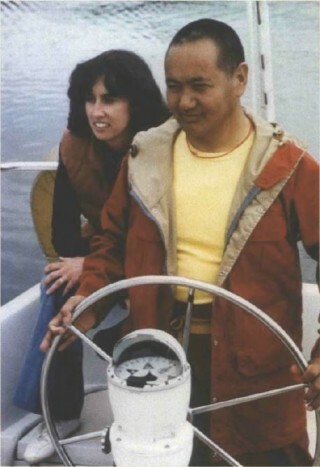 Lama Yeshe with Pam Cowan, sailing in Seattle. Connie Miller had returned to the United States, and Lama finally gave permission for her to be ordained, telling her to invite her elderly parents to the ceremony. “The only robe I had was a zen,” said Connie. “Lama lent me his chogu, the outer yellow robe worn during teachings. Somebody else rustled up a sleeveless yellow blouse and I ran up a shemtab on a sewing machine. The night before the ceremony, Lori Cayton and my old boyfriend cut off my hair. When I introduced my parents, Lama looked straight at my father and said: ‘How do you like what I have done to your daughter?’ My dad answered: ‘I think it’s wonderful. I have three more you can have!’ My mother’s mouth just dropped open. My dad worked for the State Department and no one in the family ever went to church, except me.